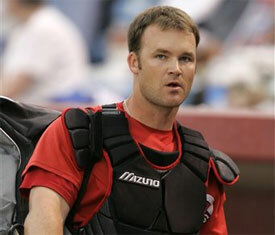 Ken Rosenthal of FOX Sports reports the Phillies are interested in catcher David Ross, who was released by the Reds. Ross, 31, was hitting .231/.381/.366 with 3 HR and 13 RBI in 173 plate appearances with Cincinnati this season. I’d place a move like this right there with the Pete LaForest move last season. Why bring in Ross when Jason Jaramillo is giving equal production (.256/.322/.372, 7 HR, 32 RBI) without the cost? And why a backup catcher anyway? There are other pressing needs (right-handed bat to spell Ryan Howard, contact-hitting bench bat) for the offense.